Talise Wellness Executive Chef shares her passion about healthy cuisine! Summer in Dubai. Hot climate. 2015 the high temperatures started early and this year Ramadan falls amidst the hottest period of summer. Muslims observe strict fasting on food and beverage from sunrise until sunset during the holy month of Ramadan. When breaking the fast and during the night the intake of food and beverage can make a huge impact on health and wellbeing. Even though I am always advising in my cooking classes and consultations on the advantages of regular healthy food and liquid intake, I believe in this very specific fasting period healthy food can be enormous beneficial. Steam the broccoli for 3-5 minutes. Blend with water or vegetable stock and garlic. Season with salt, pepper and nutmeg and serve with a drizzle of aromatic pumpkin seeds oil and freshly cut chives. Divine!If you would like to do a little bit extra garnish, pan fry the skewer with cherry tomatoes and smoked tofu in a little bit of olive oil and serve with the soup. This is optional, a bit more work but worth trying, especially if you have guests. This smooth-textured low calorie soup has a delicious fresh taste, a chlorophyll and vitamin packed appetizer, lunch or dinner. 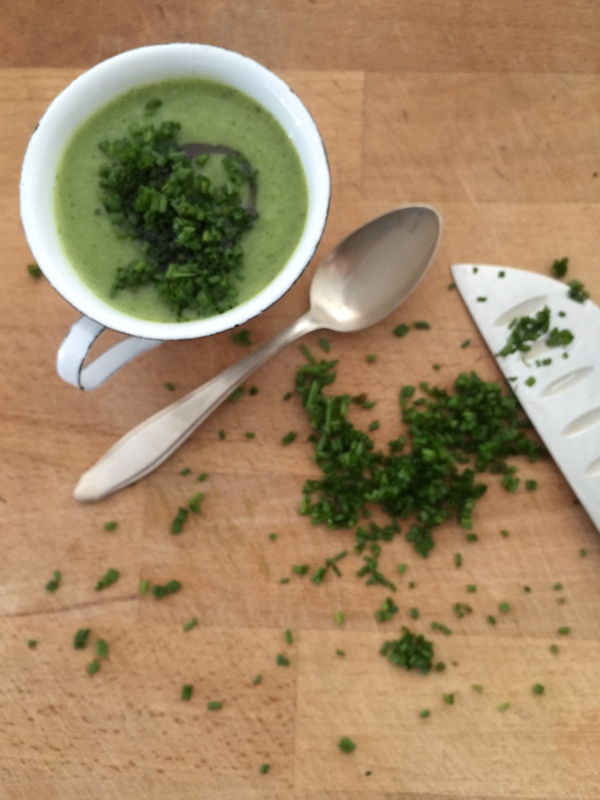 If you wish to know what else to do with broccoli, per se a very healthy vegetable, read my blog post a bout Chlorophyll and try my raw and vegan Broccoli Pesto here. Lovely to dip crudites in it, or wholesome bread, flax crackers or with zucchini pasta. Our latest filming will be aired tomorrow, Friday, at 9 pm, at the Green Apple Show on MBC1…..very excited, and hope you all watch! I have been very busy at work the last few weeks. Oh what am I saying, the last few months! No chance for even a short trip abroad to visit my beloved Bavaria, where I come from, to see the winter. Everyone at home is jealous though that I have everyday sunshine and warm weather while they have been freezing and shoveling snow. At least until recently, now finally some signs of spring are in the air. flavors from home – away from home. Braise in olive oil until golden the potatoes, parsnip and carrot with bay leaf and mace. Then add the vegetable stock and simmer for around 15 minutes on low heat. Add the leek, season with salt and pepper and serve with fresh marjoram leaves sprinkled all over. I add sometimes dried cepes to the soup – they give this simple soup a significant upgrade! Must try. This is what I cook at home when I feel not like cooking. A really easy to make recipe. Even though I am far from recommending a diet restricting anything else than just one food item I admit that cabbage soup works wonders…..and is truly recommendable to be included in your healthy menu plan. But I just wanted to use the headline. 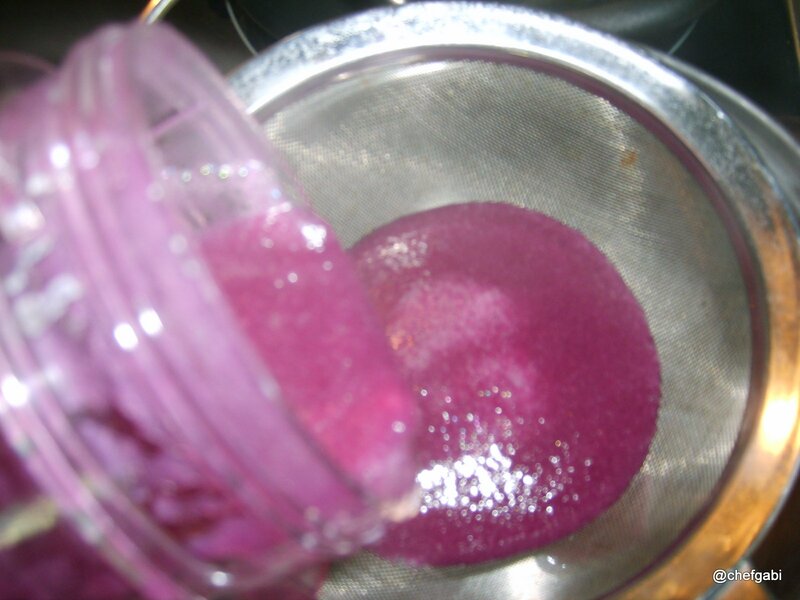 Because my cabbage soup is magic – only look at this color! 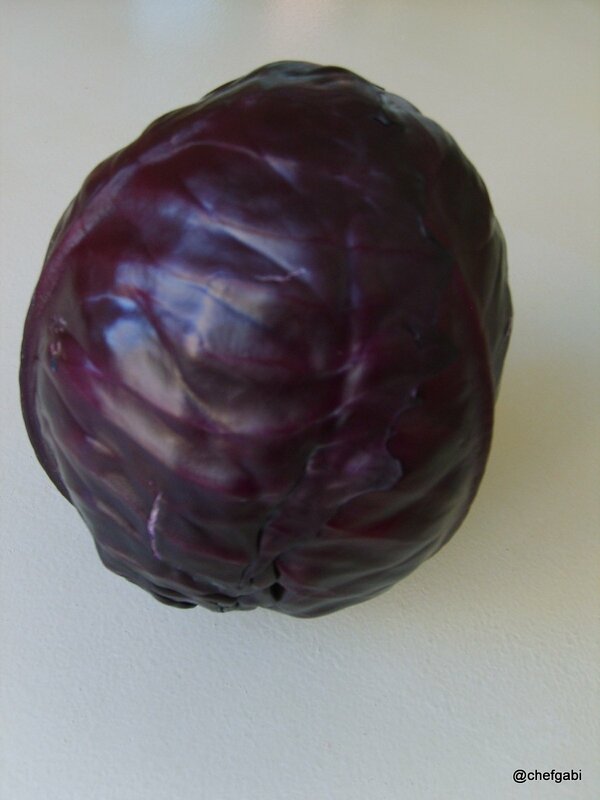 It is made of red cabbage. I love purple anyway. 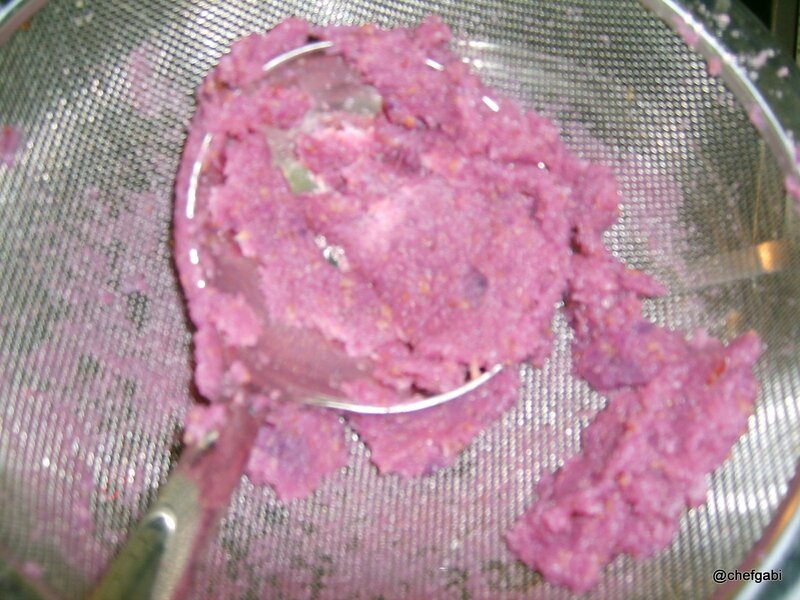 Purple in foods is due primarily to their anthocyanin content. The darker the blue hue, the higher the phytochemical concentration. 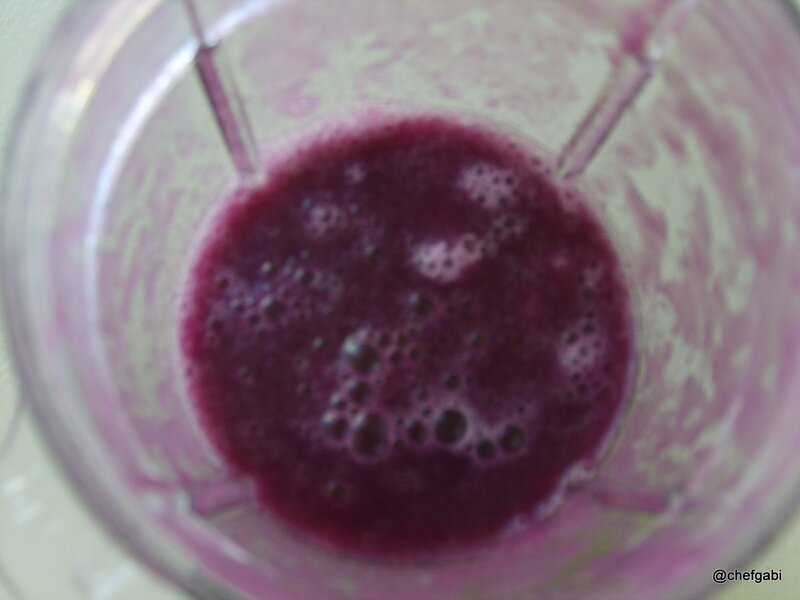 Anthocyanins are antioxidants that are particularly heart healthy and may help support healthy blood pressure. As a color is so special for food and a little bit irritating at times. But nothing to worry. Everything in the following recipe is natural. You can make it for a great entree in a menu, or just use it as the “Magic Soup”, that helps you to manage your weight and to detox. Enjoy! Braise the shallot, cloves, apple and cabbage in olive oil and agave syrup. Add 300 ml water and simmer for around 20 minutes. Blend the soup and work through a semi fine sieve. Season with salt, pepper, and vinegar. 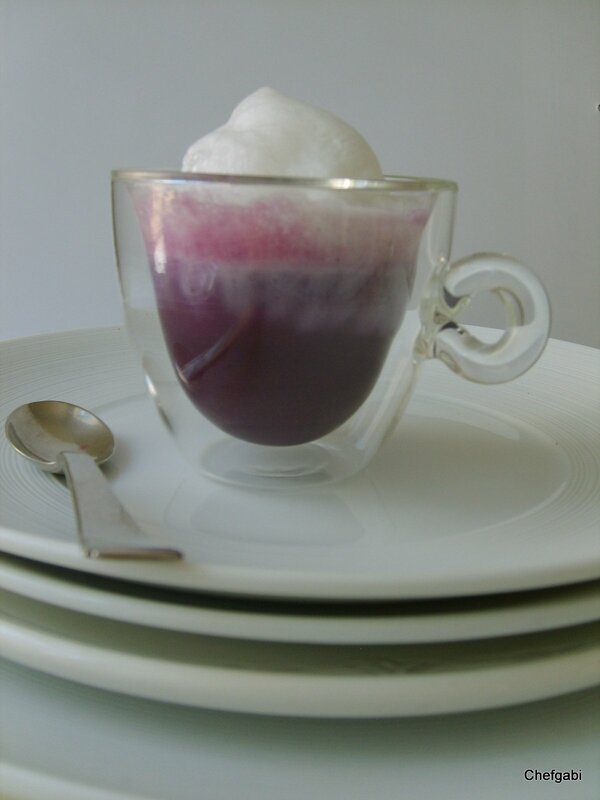 Top the soup with soy milk foam. Bad weeds grow tall. Everyone owning and maintaining a garden knows what this means. Painfully. Apart from gardening in Dubai, there is a lot less weeds around thanks to hot climate. I have never seen the below described weed there. Lucky me! But anywhere else there is a constant fight against the ever growing weeds hiding between the beautiful flowers and plants we want to spread their leaves. Weeds just mingle and try to match as long as they are young. Later they take over your garden. This can happen before you know it. And then it becomes a big task to eliminate them. But necessary, if you wish your wanted plants to have space to breathe. I am sometimes undecided about so called weeds. They can be a delicious asset to the kitchen. Sometimes at least. Gardeners for sure know ground-elder. It belongs to the carrot family and is named the worst weed ever for a garden. BUT: It is edible! Ah, great idea: The smart gardener cooks with weeds. Organic weed management, ha! Let’s eliminate it by heavy use in the kitchen then…I thought and yes, this works if you manage to use it often enough. 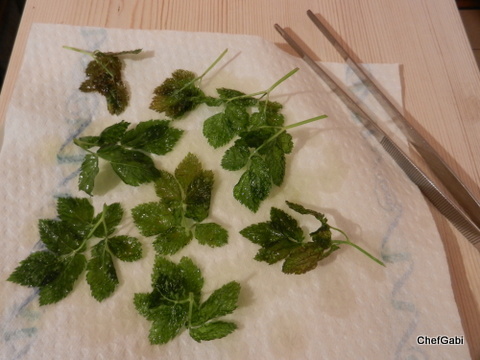 Here is one recipe I like, with crispy fried ground-elder leaves. Fried their taste is really lovely. 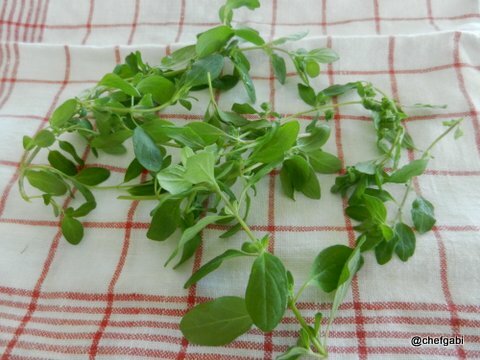 The raw leaves can be eaten in salads as long as they are young and tender. They have an earthy taste, matching well with anything of sweeter taste like sweet potatoes, carrots and pumpkin for example. Cut the carrot, onion, potato, ginger and pumpkin into chunky pieces. 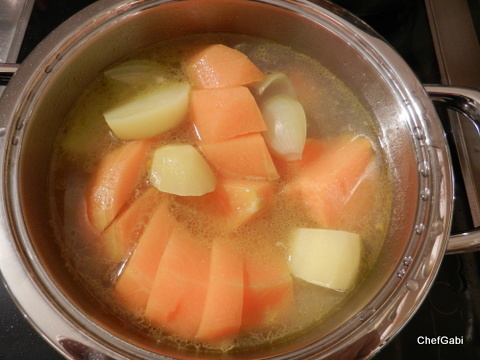 Boil them for around 10 minutes in 250 ml water or vegetable stock until they are soft enough to puree. Blend water/stock and vegetable pieces to a creamy soup. It could be that you need a little bit more additional liquid to achieve the right texture. Then season the soup with salt and pepper. I often add a dash of orange juice and zest, and sometimes I love to add a little bit of fresh chili too. But this is my very personal taste. Without you get the milder version. Just try it….! For the crispy ground-elder preheat a non stick pan. 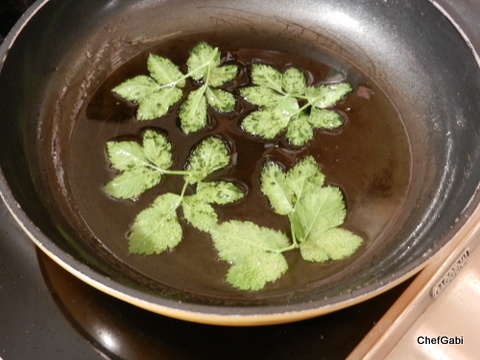 Fry the leaves in the hot oil for just a few seconds and pat dry them on a kitchen cloth. Note: The oil must not be too hot though, otherwise the leaves turn brown. 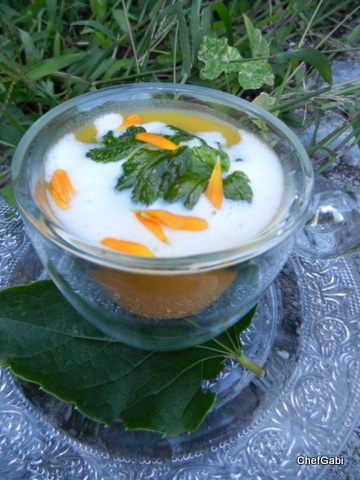 Garnish the soup with whipped cream, topped with crispy ground-elder and marigold blossoms. Ground elder has got some remarkable health benefits too: It can be used against rheumatic diseases, and strengthens kidneys and bladder. 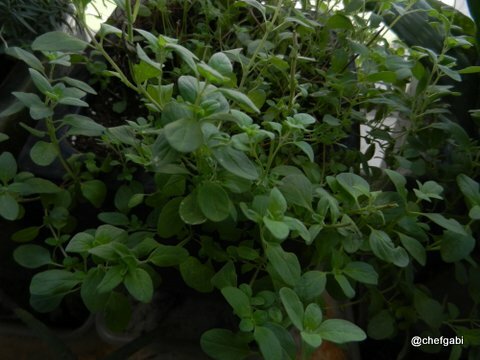 Overall it is said to activate our metabolism, helps to detox our system and provides us with chlorophyll and Vitamin C. Not bad for a so called “bad ” weed, isn’t it? Stay healthy, balanced and enjoy life! 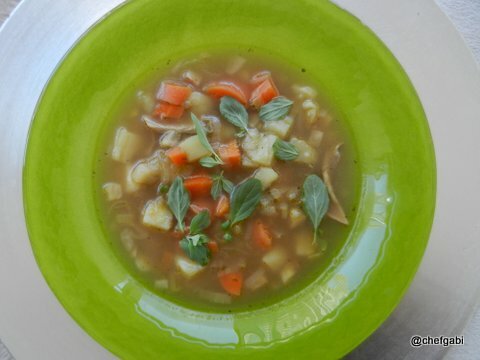 Are you looking for a quick soup – other than the one I shared in a previous post (cauliflower soup)? 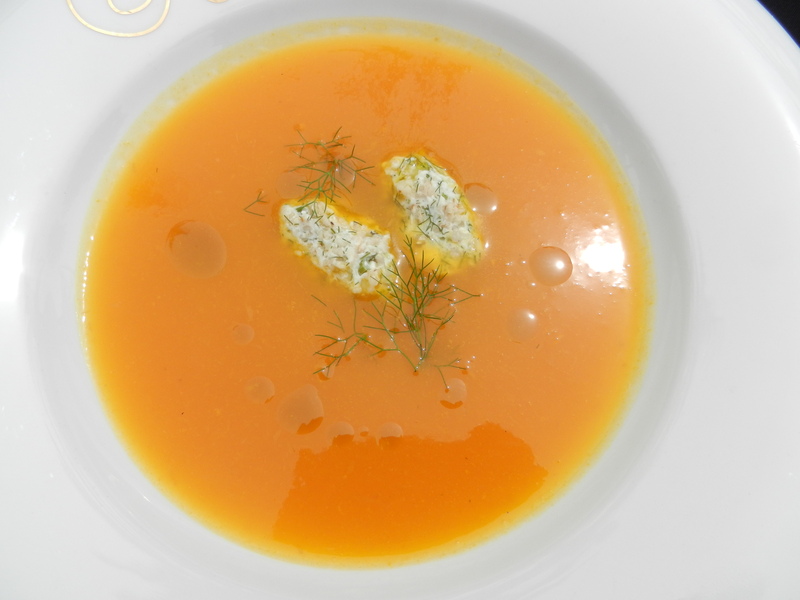 Here is another lovely velvety soup, same or similar procedure, this time with carrots. You know: Lots of antioxidant agents, rich in Vitamin A, Vitamin C, Vitamin K, potassium and fiber! I love my carrot soups most of the time with a hint of spiciness, say chili to give it a hot direction or dill or chervil if you like mild but peppery tones. This soup promotes bright colors, a lovely blend of flavors, a load of vitamins, light protein and a portion of energizing good carbs in the form of oats. It just has it all! Cut the carrots, onion and garlic coarsely and cook in vegetable stock until they are tender. Blend and season with salt and pepper. For the quenelles mix the oat flakes with some milk, add the cheese and the egg, season with salt and pepper. Chop the herbs and fold them under. Preheat a small pot with water, form small quenelles with two teaspoons and simmer the quenelles for around 10 minutes. Serve them in the soup, with a drizzle of herb oil. The quenelles stay perfect in shape if you simmer them on low temperature. As soon as the water starts boiling and bubbling, they tend to break apart. Enjoy and stay healthy and energized! I am apparently very busy those days and just wanted to share a tip with all of you who face similar problems once in a while. When I can’t spend much time in my kitchen at home, I do a vegetable puree soup. The texture and density comes from the vegetable you have chosen itself. And yes, this works with many vegetables. So I just check what’s in the fridge – carrots, pumpkin, broccoli or cauliflower. I follow always the same procedure: Clean the vegetables, cut them into chunky pieces and steam them over boiling water until they are tender enough to puree them in a blender with some liquid. This can be vegetable stock, milk, or simply water. I season the soup and it can be served. 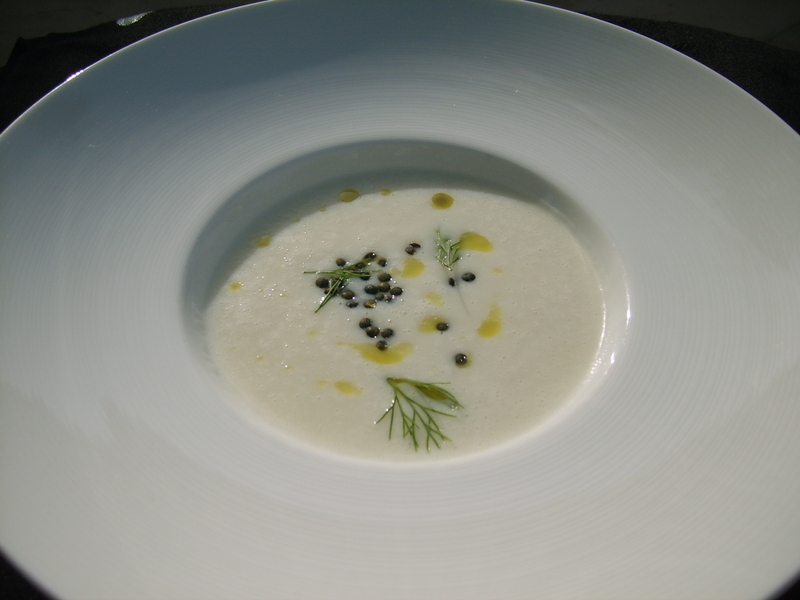 Here is my favorite cauliflower soup. A vegetable often underestimated. You should try it. The lentils are an extra, the soup tastes also great without them, just sprinkled with some chives or a cloud of whipped cream. Use the whole cauliflower for the soup: Cut it into chunky pieces and steam until it is soft. Blend the cauliflower with 500 ml of the vegetable stock, the milk and garlic until a creamy texture is achieved. The amount of liquid might be increased if the soup is too thick. Season the soup with salt, pepper and a little bit of freshly grated nutmeg. For the lentils dice the carrot, zucchini and leeks. Braise the dices in olive oil; add the beluga lentils and 100 ml of vegetable stock. Simmer for 10 minutes and set aside. Pour the soup into warm soup bowls, place beluga lentils in the center and drizzle some herb oil over the soup. 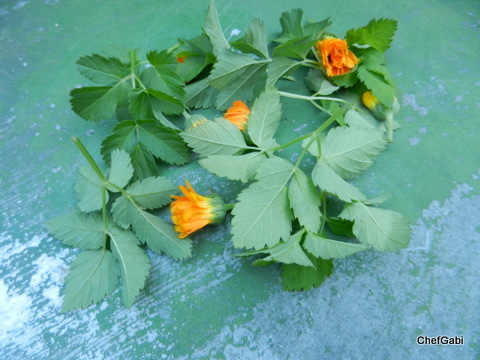 For those who wonder now how I make the herb oil: I will share my recipe with you very soon! Blend all ingredients in a bar mixer and strain. Serve garnished with mint and coriander leaves. 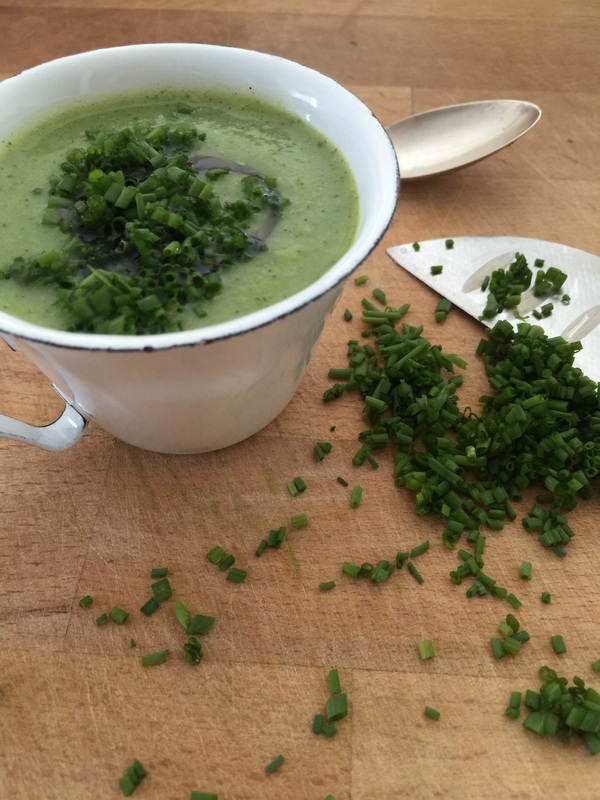 This chlorophyll rich refreshing soup is perfect for any occasion. It is very easy to make, and done in 10 minutes, but it can’t be prepared long time in advance. I serve it very often with crispy quinoa grissini. Click here to know more about quinoa as an ingredient and how to make the Grissini in our previous post.